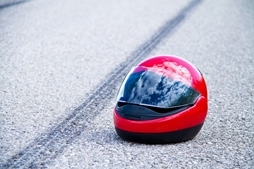 A motorcyclist succumbed to his injuries this week after suffering severe head trauma from a crash with an automobile in Orange, CA, as reported by the Orange County Register. The accident occurred on August 14th, when the motorcycle with two passengers struck a stopped vehicle while avoiding a car making a U-turn on Santiago Canyon Road. The impact threw both riders from of the bike, causing severe head trauma to the driver. The passenger also suffered significant injuries, but is expected to recover. Sudden sleepiness. Accidents are exhausting, but tiredness usually doesn’t settle in for hours, after all of the stress hormones have worn off. Get medical help right away if someone suddenly shifts from wide awake to falling asleep right after an accident, especially if the person is actively fighting to stay awake. Vomiting. The extreme stress and anxiety of an accident might cause vomiting, but so can bleeding inside the skull. Seek medical help to be on the safe side. Weird behavior. People react to stress from accidents in different ways, but unusual behavior can be a sign of serious internal damage. Examples might include aimlessly wandering from the scene, slow or delayed movements, or an inability to focus or concentrate when being spoken to. Unusual speech patterns. Head trauma can cause an inability to speak correctly, including speaking nonsense sentences, using incorrect words, or mixing up the sounds of words. Any of the above symptoms should be treated as critical emergencies. If you notice one or more of these symptoms, or any other symptoms of head trauma, call 9-1-1 immediately, as the victim’s life is at risk. After medical care is taken care of you may wish to speak to an attorney, as the cost of emergency treatment can add up fast. Steinberg Injury Lawyers has the experience to help you every step of the way after you’ve been hurt in a motorcycle accident, and we will fight with integrity and honor to get you the fair compensation that you are owed. Call us any time, day or night, for a free case evaluation at 800-989-6385.